The Destination Institute provides educational opportunities for tourism industry partners and for our community. The Destination Institute programming focuses on information and resources that will elevate our community's ability to service and attract visitors to Lexington and the Bluegrass Region. Active participants may apply to become a part of the Hospitality Host Committee. 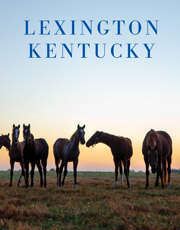 The committee helps industry partners connect with the material and training resources offered by VisitLEX. If you are interested in learning more about The Destination Institue, please email program manager Julie Schickel at jschickel@visitlex.com.